From stupid comments to actual threats – This is UNACCEPTABLE and we’ll take ACTION ! Alright, this is going too far. Since years, Webactivism has exposed hundreds of cyber crime involving copyright fraud, as well as fraudulent court orders. Of course we were always going to be hated by the criminals who lost business over this. Past few months have seen a rise in outrage from these criminals, who are mostly associated with rogue and criminal reputation agencies based out of US, India and Russia. Yes we know who they are, but we never targeted them. Our intention was to set a deterrent to ensure that illegal methods to suppress online speech stopped permanently. Their method of outrage was merely an inconvenience up to this point. An ineffective nuisance, which consisted of them setting up dozens of spammy websites against Webactivism, in an attempt to hurt our credibility. They also set up websites stuffed with adult keywords, as a negative SEO practice. Again, we didn’t mind. They targeted individuals and organisations not associated with us. Basically, they were just shooting arrows in the dark and targeting everyone, hoping that some will hit the mark. As usual, we didn’t mind. In fact, we played along and let them do it. It was not our burden to do anything regarding those attacks on non-associates. Why would we? If someone is being targeted, we’re not responsible. However, something happened today which invites serious consequences. One of our founders received a phone call on his home-number, and the perpetrator spoke to his 8-yr old son who later handed over the phone to our founder’s wife. The perpetrator proceeded to relay a message which included a direct threat of physical harm to our founder, and his son. His direct words were – “if the website is not shut down in a week, we know where your son goes to school”. That’s a direct threat, and absolutely unacceptable. Our founder’s wife is not aware of this website and it’s operations. She immediately informed our founder, who attempted to call the number from where the call originated. We will publish that number once the law enforcement authorities give us the permission to do so. 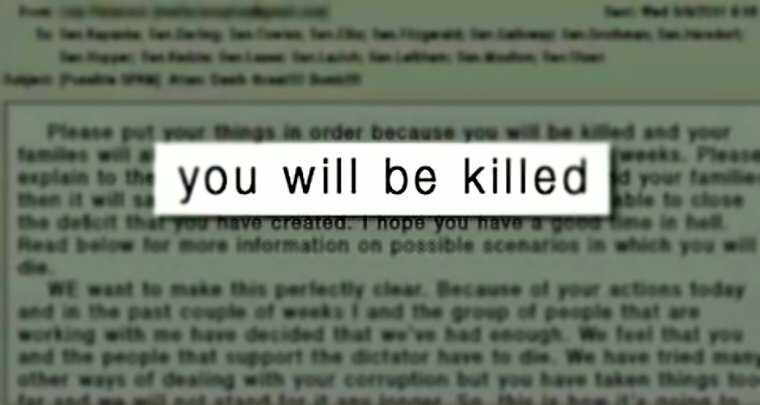 The follow-up threats boasted on how they will carry on the threat made earlier if the website stays alive. In addition, they reiterated their policy of running a libel campaign of anyone involved with Webactivism on their dozens of websites. Here are some of the previous comments (which we did not approve) in line with this threat they made. There are dozens of other threats posted in comments. Here are the spammy blogs created against Webactivism, which we would have ignored earlier. But not now. Threatening a child? Telling a lady that you’ll harm her husband and child? Over some factual investigative reports exposing cyber crimes? Fake DMCA is normally a misdemeanor. But this incident takes this to a whole new level. We’ve already contacted the law authorities. They have the phone number, the Whatsapp number and messages and it’s being investigated as we speak. We intend to take these comment threats and the threatening blogs seriously and contact their host. We will also launch a campaign to contact every ‘beneficiary’ listed and inform them what their ‘Reputation Agency’ has been up to. Trying to secure Reputation is one thing. 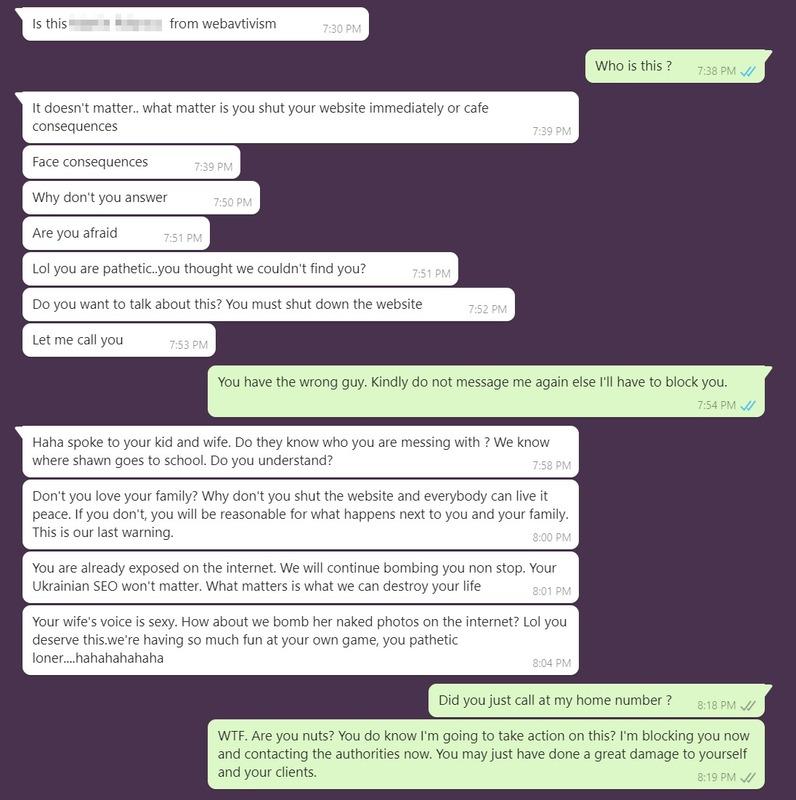 Fake DMCA is stupid, but threatening a kid is cowardice and needs to be punished. Shame on you, and shame on these people who are hiding behind these criminals. And if you think you’ve made us look over our shoulders, you’re wrong. You’ve actually strengthen our resolve to go on. Exposing fake DMCAs may feel like a useless exercise, but it’s just one of the many good things we do at Webactivism.